The electrician that I had been working with told me to get the Lopolights because they were completely sealed and lasted longer than anything he had seen. The downside – they are really expensive. Recently, I’ve also heard of people having issues with them burning out due to voltage fluctuations. Lopolight recommends adding a filter module which I plan on adding later. 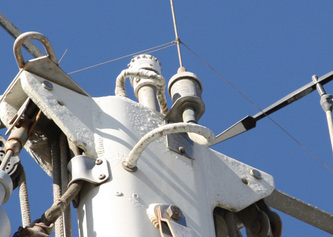 I had a bicolor bow light, aft light, and mast head anchor light. I decided the bow light needed to be the most robust. The fixture was broken already and held together, successfully, for the last 3 years by Rescue Tape. So I bought a bicolor Lopolight. In order to mount it, I had to make a bracket out of Starboard that would interface with the existing stainless bracket. Someday, I may cut off the existing bracket and make one specifically for the Lopolight, but I think the current one looks OK, so it is at the bottom of my to do list. After installation the Lopolight is so bright it is like having red and green headlights on the bow - beautiful. The aft fixture was still in good shape. I didn’t want to spend the cash on another Lopolight but didn’t believe that a drop-in LED replacement bulb would cut it. 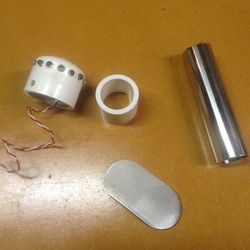 I had read in the SSCA newsletter that a number of folks had used Bebi Electronic lights and were happy with the product and service. The price is right as well. So much so, that I really had nothing to lose by trying them (lifetime warranty too). Bebi had a good article on their website describing how to modify a fixture to accept the Bebi light. I did as suggested and had no problems with the install. 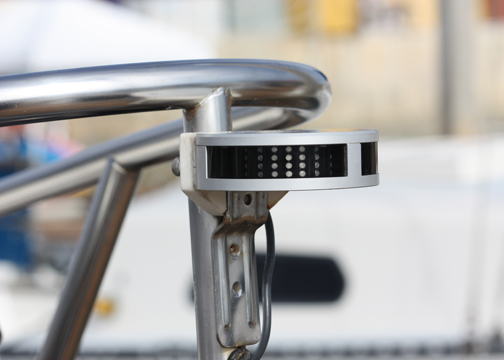 The Bebi aft light is also brighter than the original and we are very pleased with our choice. 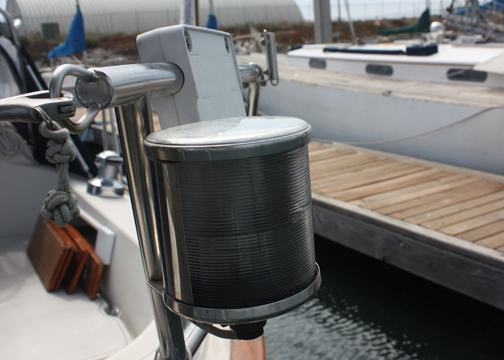 Lastly, I bought a Bebi anchor light (with auto-on and -off daylight sensor). It is brighter than the old one, and draws a fraction of the amps. Also, because of the sensor, it can be left on during the day when we are out and about, and it will turn itself on at dusk. I fabricated a mount using 1 inch stainless tubing, some stainless flat bar and a small piece of PVC pipe which fit nicely inside the Bebi light and snugly over the stainless tubing. This turned out to be my first welding project for the boat and I was pretty happy with the outcome. I waited to drill the holes in the base until I had removed the old light. Using that as a template I drilled the holes in the new mount to match the existing holes in the mast. The wiring was pretty straight forward. 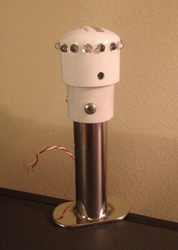 Bebi mast fixture, before assembly. Bebi mast fixture, after, with my welded base.